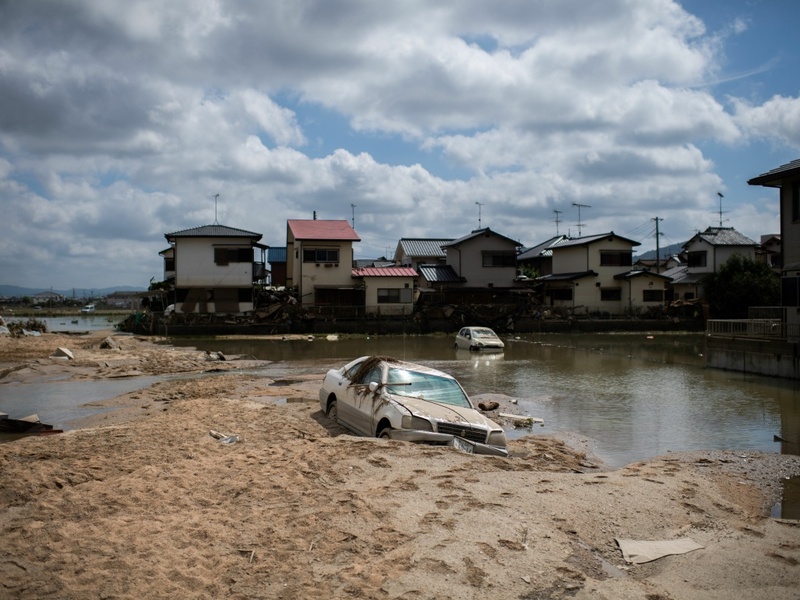 A damaged car is seen stuck in the mud in a flood hit area in Mabi, Okayama prefecture on Tuesday. At least 148 people are dead in western Japan and dozens are still missing after record rainfall that sparked flash floods and mudslides over the weekend, officials said, according to broadcaster NHK. Search efforts were continuing for at least 59 others are still missing, most in hardest-hit Hiroshima prefecture. The Japan Times reports rescuers on Tuesday were looking for people stranded in homes and in flooded areas that had not yet drained. The newspaper says that the number of dead is the highest for a rain-related event in the country since 1982. Authorities on Tuesday were also struggling to restore utilities to the flood-stricken areas. At an emergency meeting in Tokyo on Tuesday, Prime Minister Shinzo Abe said the federal government would streamline the process for emergency aid. "We will assess the needs of victims and push for quick reconstruction," Abe vowed. According to Reuters, electricity has been restored to all but 3,500 customers, but more than 200,000 remain without water. "There have been requests for setting up air-conditioners due to rising temperatures above 30 degrees [86 degrees F] today, and at the same time we need to restore lifelines," Finance Minister Taro Aso told reporters after a Cabinet meeting, according to the news agency.